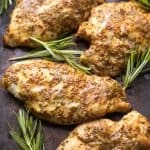 Paleo Rosemary Honey Mustard Chicken Recipe – chicken marinated in a rosemary honey mustard sauce and baked in the oven. Ready in 30 minutes! Gluten free, grain free, dairy free, refined sugar free, soy free, clean eating, real food. 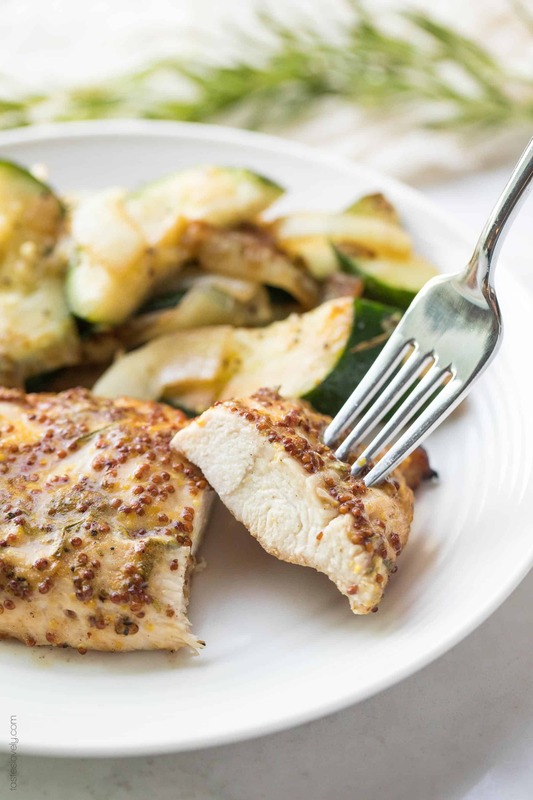 If I had to sum up my cooking style in 1 recipe, this paleo rosemary honey mustard chicken might be the one. It represents everything I love about cooking! Taking a healthy protein, adding some simple and fresh flavors to it to jazz it up to the next level, the oven does most of the work for me, and it is ready in 30 minutes. My cooking philosophy in a nutshell. 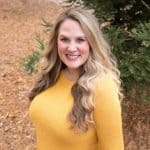 I’ve shared so many quick, healthy and delicious chicken dinners in the past, and love having another winner to add to my arsenal. 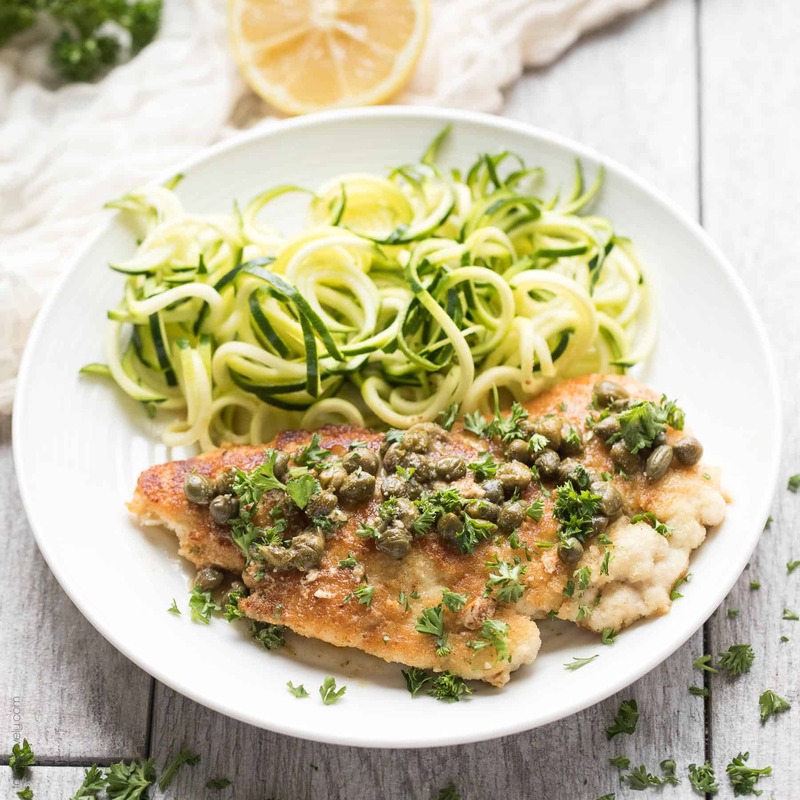 You’ve all loved my paleo + whole30 chicken piccata, my paleo + whole30 almond crusted pesto chicken, my paleo lemon honey chicken & asparagus skillet, my paleo + whole30 chimichurri chicken skewers, my paleo + whole30 grilled lemon rosemary chicken, the list goes on and on. 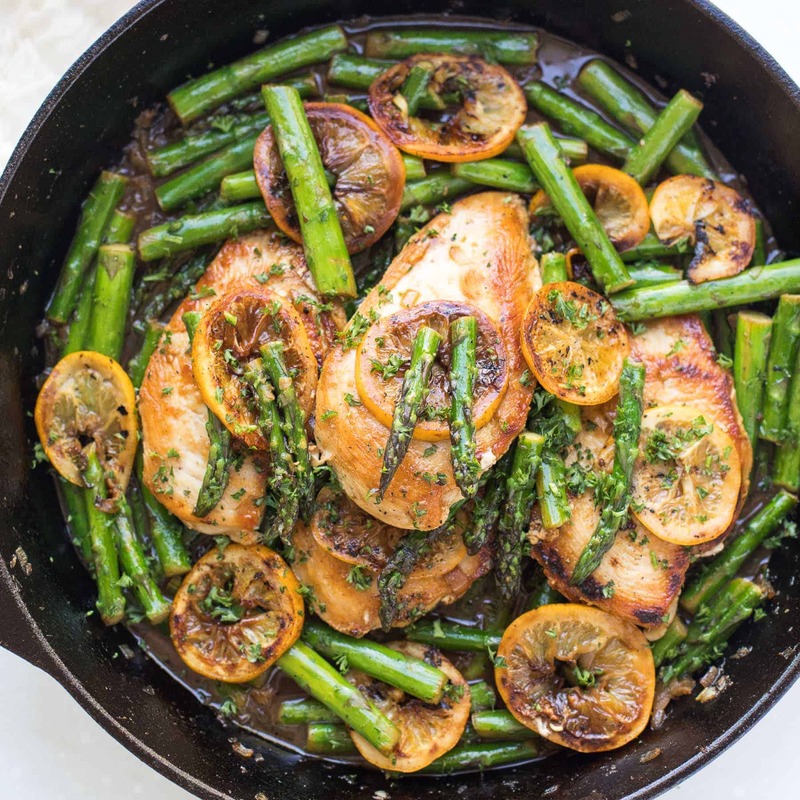 You can never have enough healthy chicken dinner recipes, right? 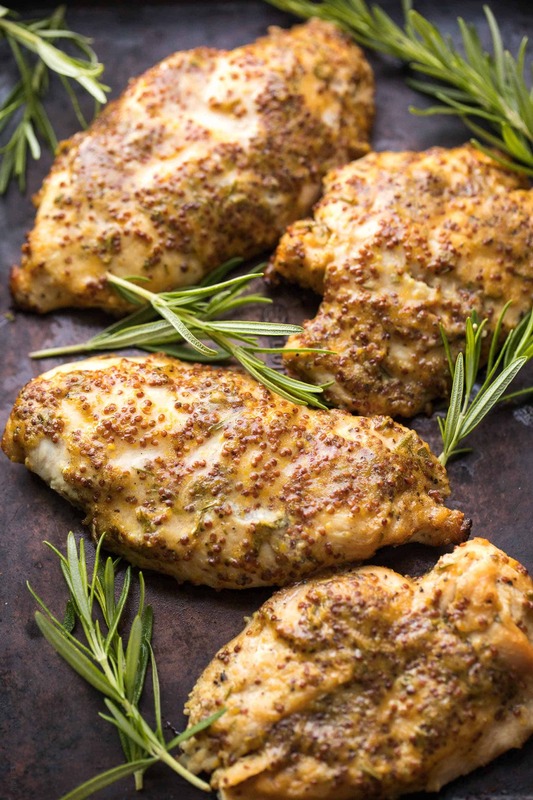 The best part of this chicken is the rosemary honey mustard marinade. So simple! I use both grainy mustard and dijon mustard. You can marinade it for as little as 10 minutes if you’re in a hurry. Or if you’ve planned ahead it can marinade for a whole day. Then, just lay the marinated chicken on a wire rimmed baking sheet, bake for 20 minutes, and dinner is ready! 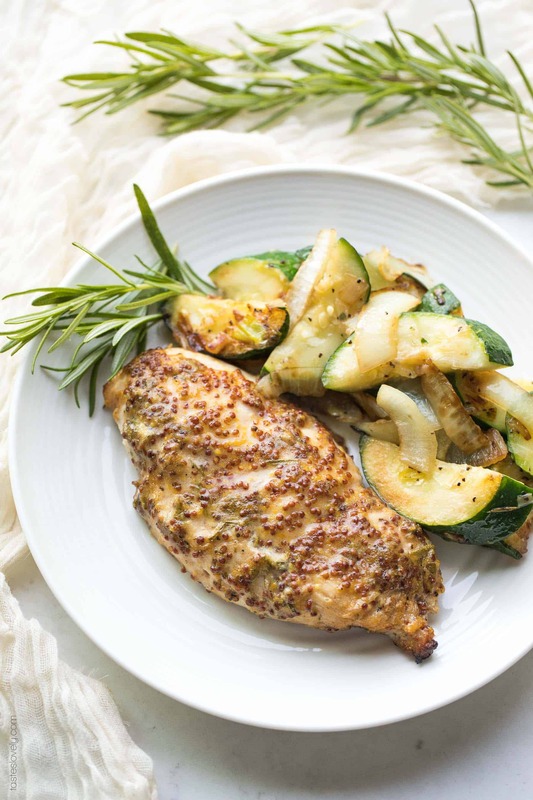 This paleo rosemary honey mustard chicken is such a winner because both grownups and kids love it. My 2 year old gobbles it down, and so does my husband. Don’t you get so happy serving a dinner everyone loves? I especially love how healthy it is! 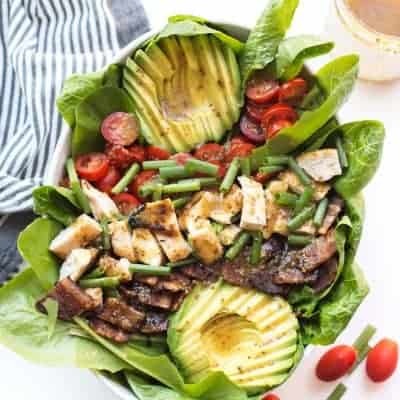 Paleo, gluten free, grain free, dairy free, refined sugar free, soy free, clean eating, real food. In a medium size mixing bowl combine the grainy mustard, honey, dijon mustard, rosemary, garlic, salt and pepper. Stir to combine. Add the chicken breasts and marinate for at least 10 minutes, or in the refrigerator for up to 1 day. Preheat oven to 425ºF with the oven rack in the upper 1/3 of the oven. Line the rimmed baking sheet with parchment paper or aluminum foil, and place the wire rack inside. 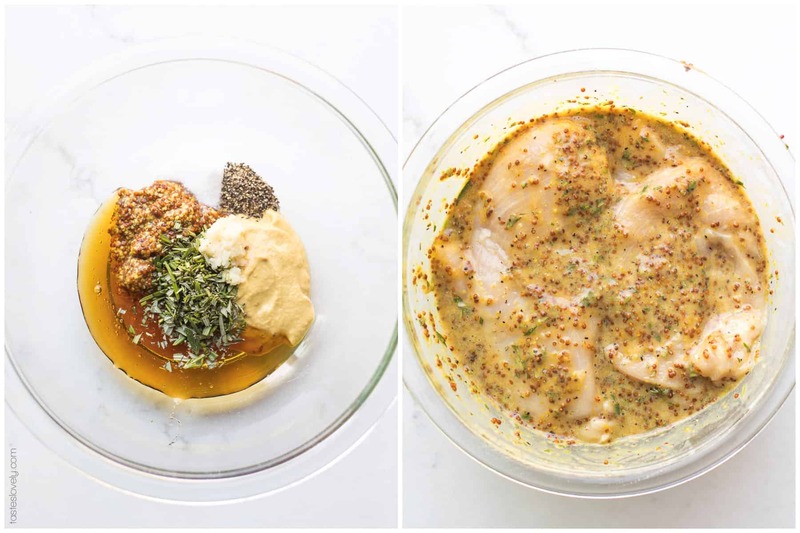 Place the marinated chicken breasts on the wire rimmed baking sheet and roast the chicken until it reaches an internal temperature of 165ºF, about 15-20 minutes. Remove from the oven and allow to rest on the baking sheet for 5 minutes. Serve warm. These are also great grilled on your BBQ! Preheat your grill to medium high heat, and cook 20ish minutes until the chicken is 165ºF. I don’t flip the chicken so the marinade bakes on to the tops. If you flip it, the marinade tends to stick to the grill grates. Rosemary is very aromatic and will enhance my appetite. This recipe will surely mouthwatering and ideal for any occasion. I will cook it in the future. Thanks.